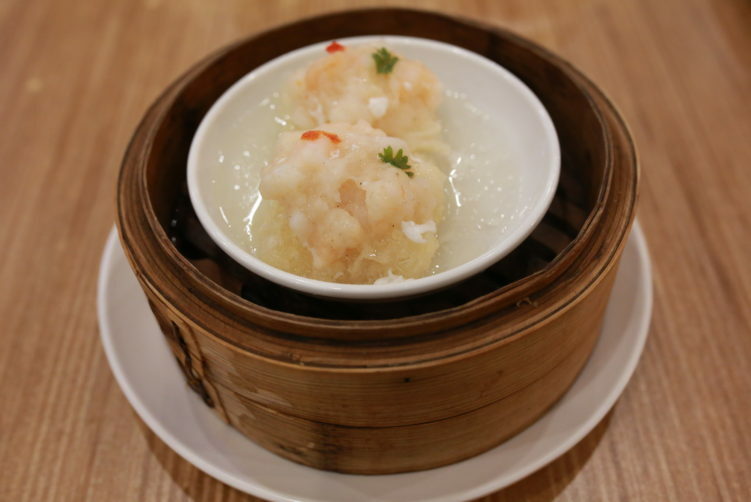 “The Long Awaited Michelin Starred Dim Sum Restaurant” is what greets you at the Tim Ho Wan branch in Terminal 21 in Bangkok. But it all started out with a hole-in-the-wall under a bridge in Hong Kong back in 2010. Against all odds they were awarded a Michelin star. 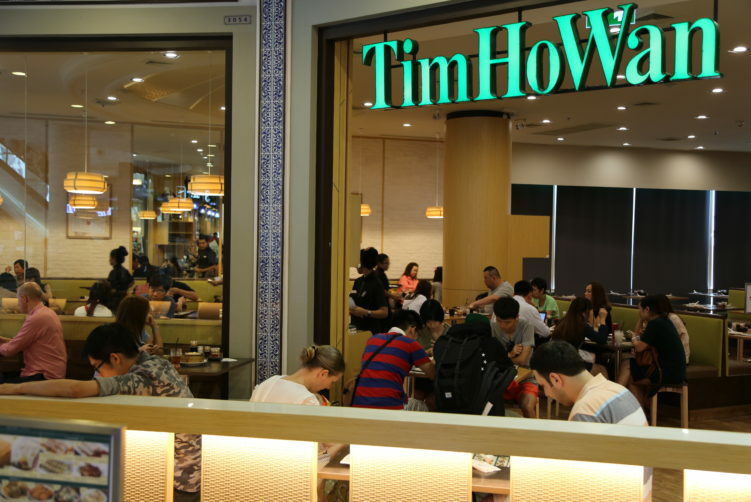 To tell you the truth, the Tim Ho Wan Bangkok branch is a far cry from reaching the stars. It’s just as far away from a glorious star as humanity is to settle down on Mars. As we all know, it’s not going to happen soon. Tim Ho Wan Bangkok have set the expectations themselves, with the welcoming message at the entrance. I decided to take them seriously and walked in with hopes for a really good meal, something close to what is served in Hong Kong. In other words, something close to a shiny star. I was well taken care of by the efficient staff, seated and given a placemat (photo) menu with about 25 dim sum items and a table to cross of my orders. I choose 4 dishes and it didn’t took more than a minute or so before they started to arrive at my table, one by one. 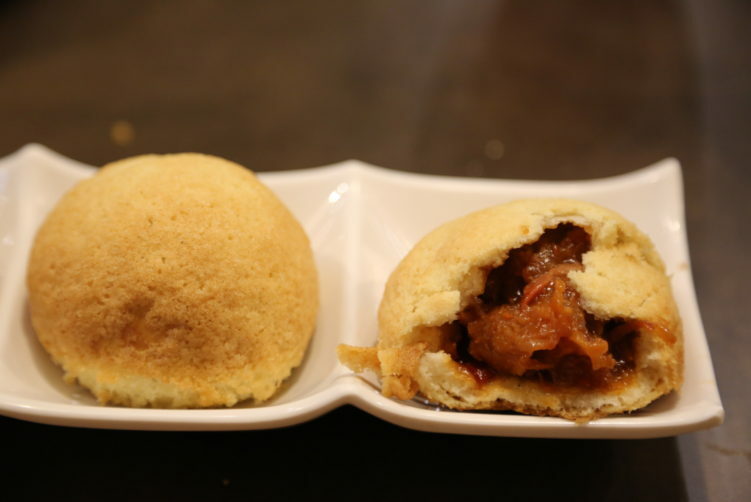 It started off with their acclaimed (Hong Kong branch) and famous pork bun, supposed to come with chunks of roasted pork and a delicious barbecue sauce. Well, probably not a surprise by now, but it didn’t. It came with two or three small (and I mean small) pieces of pork in a barbecue sauce and a lot of air. The small pieces of pork was inferior in quality, including a chewy tendon. The barbecue sauce was sweetened to a level most chefs would have declined to serve its customers if they only had tasted it themselves. One-dimensional and completely missing any sense of complexity or balance. It left my gum with a sticky coating that the slightly bitter and refreshing Chinese tea couldn’t scope off. I ate half a bun – you get three of them at B120. A completely miss resulting in 2 ½ bun returned to the kitchen. It could only get better from here on, and honestly, my stomach wouldn’t be able to swallow another pork bun experience. It got better from here on, at least for some time. The prawn dumpling (B130) was very good, with a creamy and inviting texture. Definitively the highlight of my Tim Ho Wan experience. There are better dumplings in town, especially in Chinatown, but I allowed myself to raise the expectations again. And the four pork dumplings with shrimp (shumai) could pass as decent. Less salt might have let other tastes come through, and the pork didn’t add much complexity to the bites. Shrimps again in the lead. The pan-fried radish cake was next, and it was good. It is soft, tangy, but also deliciously mild. Absolutely worth ordering. What to do next. I decided to give it a second visit to cover some more of their dishes. It was a bad choice, both for me and Tim Ho Wan. It turned into a salty holocaust to my taste buds. I’m a big fan of joke (rice porridge), or congee if you prefer. Supposedly with a century old egg, that unfortunately was reduced to some small pieces before it reached my table. And the small pieces of pork was far from excellent quality. But the biggest problem was the salt. The chef must have lost the whole bag in the pot when making it. Very unpleasant and very surprising that a vendor with such an ambition can serve this to it’s customers. Absolute not comparable to a real bowl of joke that you can find many places in Bangkok. In addition, they dear to charge you a B100 for it. That’s what I call a bad joke. Head to Prince Joke in Bang Rak if you want a real experience. 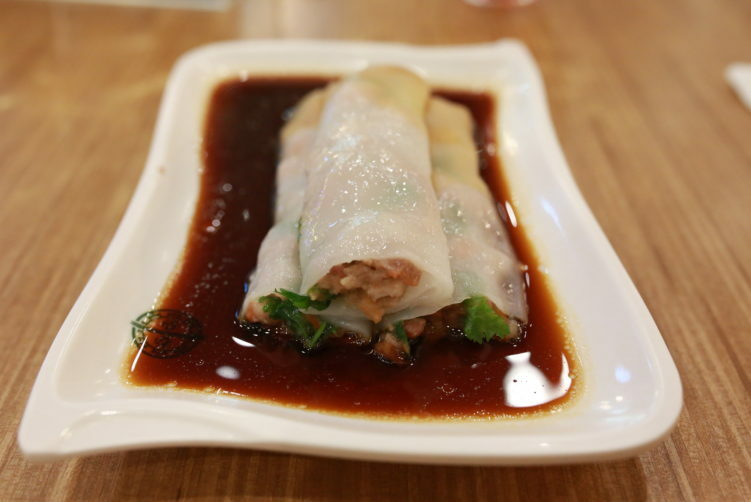 The pork vermicelli roll was a rather doughy experience. And surprisingly rather flavourless. A rather dull time for my taste buds, but maybe they were put on hold by the salty porridge. But then again it all moved back to start. The steamed fish maw with prawn paste was another salty bomb, covering any other taste beneath the surface. The texture was excellent, but that doesn’t really help when everything is hidden by salt. Dessert? No thanks. It was already to much. The ambience is the canteen type. Plenty of seats. You’re shepherded to your seat and you leave in something like 25 minutes later. It’s a quick meal in other words. That’s fine with me. 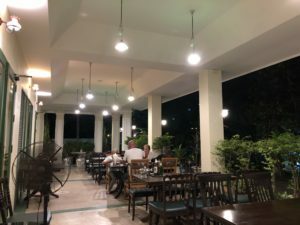 The drink menu is limited – soft drinks and tea. But the real problem is the food. There might be people liking the pork buns out there, I just hope they’re in close relation with a good dentist. The only reason to eat them must be if you need a quick weight gain. Many of the dishes are also far to salt. 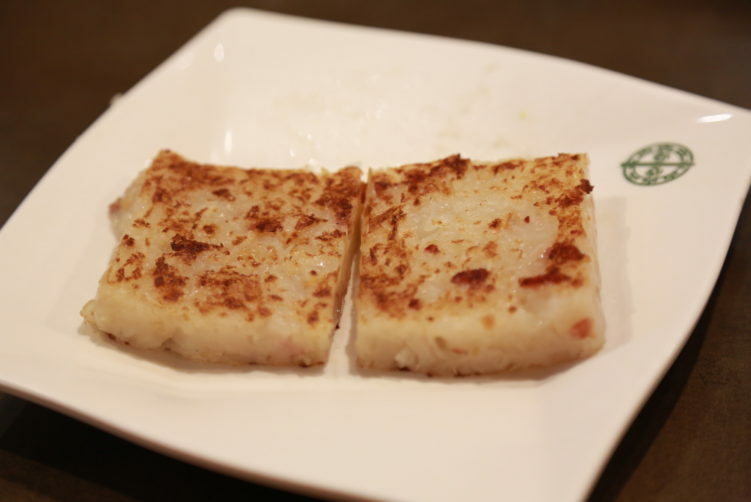 Prawn dumplings and the pan-fried radish cake was the highlights of the 7 dishes I tried. The two visits came in at B1100. Will I come back? Not in a lifetime. Shy away is my best answer. It’s really not worth it. trusted tablets Price: Each dish is B80-B150 + 17 % service charge and VAT. Expect around B500 per person, including drinks. cheap generic viagra mail order pharmacy Address: Terminal 21 (third floor) at the entrance to Sukhumvit Soi 19. How to get there: Take the BTS to Asoke or the MRT to Sukhumvit. Enter Terminal 21 and go for the third floor. The Long escalator at BTS level takes you directly there. 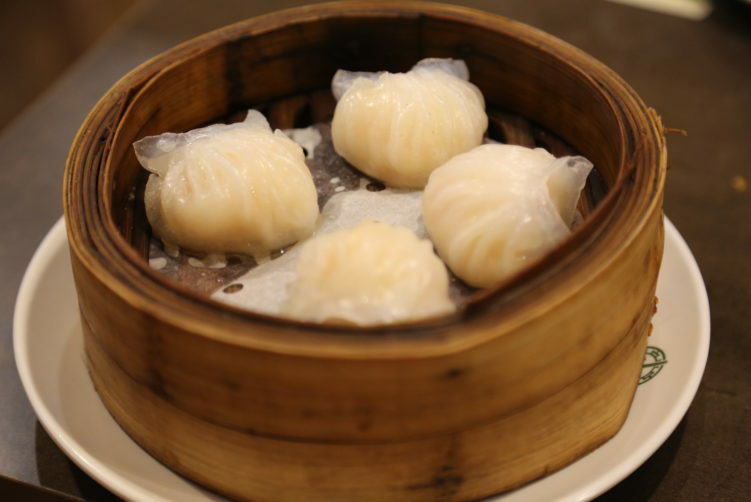 Tim Ho Wan at Terminal 21 in Bangkok is a branch of the more famous Michelin star setting in Hong Kong. 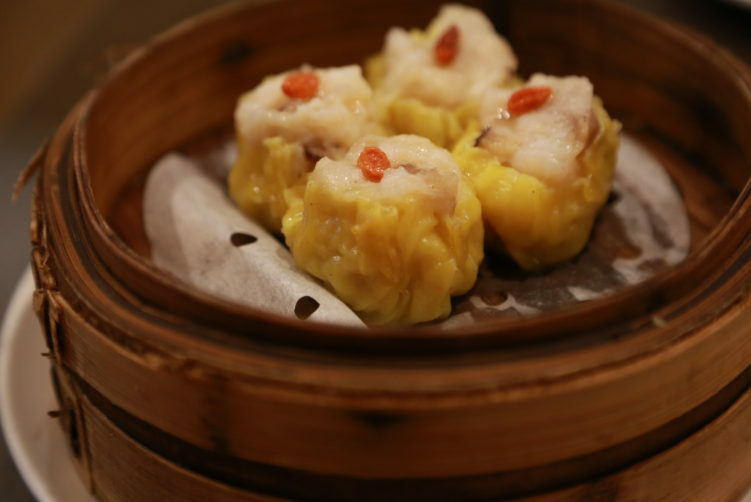 The dim sum's are mostly too sweet and too salty. Plenty of better options in town. See full review at StreetsideBangkok. Have to be careful with the Michelin star rating. 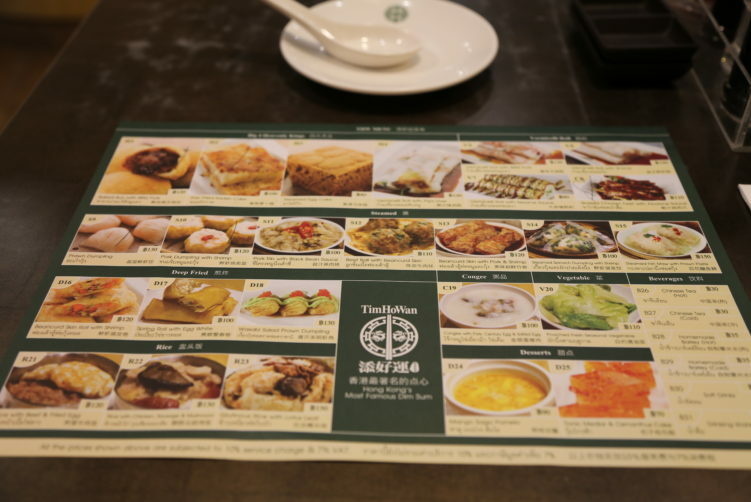 In Hong Kong there are multiple branches of Tim Ho Wan & only a few have achieved the Michelin star rating. I believe each branch must achieve the rating and maintain it on a yearly basis or they get dropped off the list. With that said, most likely the Bangkok one doesn’t really have the Michelin star just like how the branch here in NYC does not have the Michelin star either. Regardless, you are right that Tim Ho Wan is horrible because last December I went to the one in Sham Shui Po, HK which was truly rated with 1 star and i was not impressed….